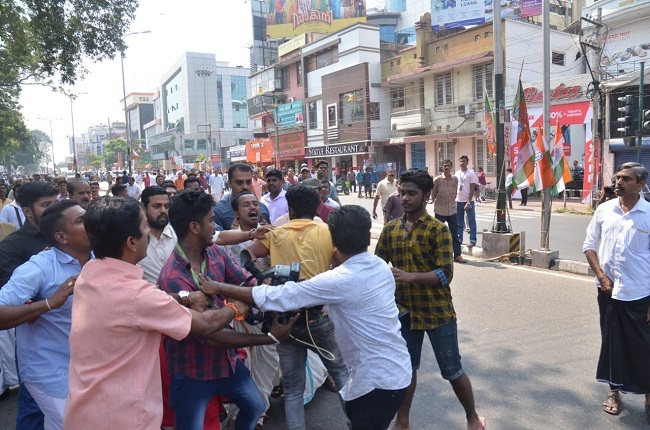 Kairali TV’s cameraperson Shajila Alifathima was attacked by protesters, while Peethambaran Payyeri of the Deccan Chronicle was also attacked and had his camera destroyed. Protests have broken out in various parts of Kerala following the successful entry of two women in their 40s, Bindu Ammini and Kanaka Durga, into Sabarimala temple, becoming the first women between 10 and 50 years to officially enter the temple since the SC verdict allowing women of all ages to enter the temple. 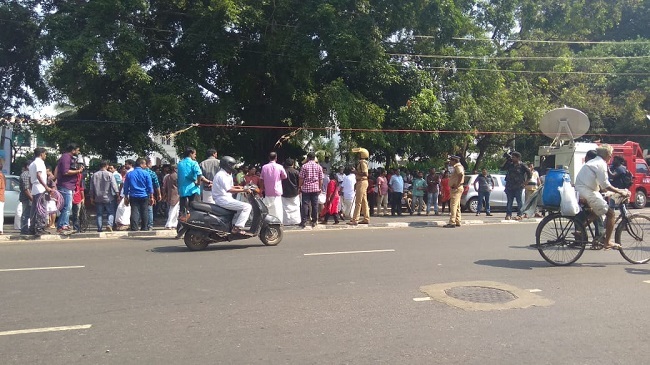 Protests have taken place at Secretariat in Thiruvananthapuram, as well as in Palakkad, Kottarakara, Mavelikkara, Karasgod, Kozhikode, Kollam and Kothamangalam. Much like the violence that was seen on October 17, when the temple had first opened to all devotees after the SC ruling, journalists on Wednesday continue to bear the brunt of the violence enacted by protesters in the wake of the developments at Sabarimala. Several journalists have been attacked thus far by protesters at the protest location outside Secretariat in Thiruvananthapuram. Journalists on the ground also report that protesters seem to be looking out for any women journalists in order to direct their attacks towards them, forcing women journalists to take extreme measures to carry out their work. “We were covering the protest when the protesters came close and began to get angry with us. When they saw a woman journalist of Asianet with a microphone, they started abusing her using slurs. They asked why she was working there. I intervened when they were about to attack her. They then turned against me. When they were about to attack me, one of them asked the others to stop. But by that time, I was kicked on my back and shoulders. My camera was damaged," says Peethambaran Payyeri of the Deccan Chronicle. The protests at Secretariat have been particularly contentious on Wednesday, with members of rival political organisations having congregated there. The protest there has seen multiple instances of stone-pelting since it began on Wednesday afternoon. Four members of the BJP Mahila Morcha were prevented by police from entering Secretariat on Wednesday afternoon. 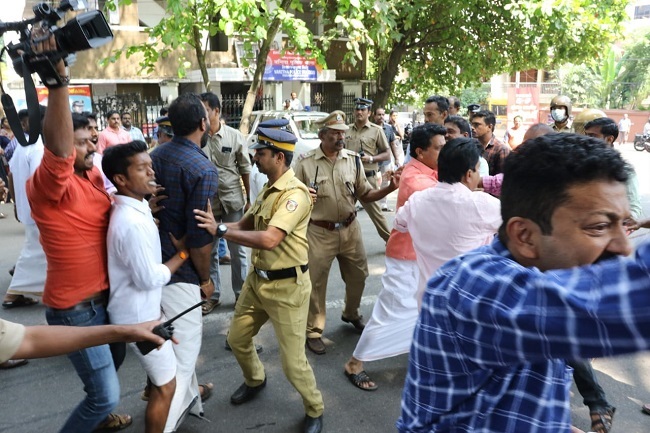 After BJP and Yuva Morcha protesters allegedly removed posters by the CPI(M) that were being displayed outside Secretariat on Wednesday afternoon, CPI(M) members and district leaders also arrived at Secretariat to protest the removal of their posters. Shops around the area are closing at the current time after sporadic stone-throwing from gathered protesters, while police reinforcements have arrived at the scene to ensure that no battles break out between different political factions. The protests at the Secretariat escalated post 3.30 pm. Police had to use water cannons, tear gas shells and lathicharge to disperse CPI (M) and BJP members who had started attacking each other. Law Minister AK Balan who was staying in the state bungalow, is currently speaking at an event in Palakkad. BJP cadres marched to the event, and forcibly shut shops on the way. They also attacked a KSRTC bus that was coming from Chitoor by throwing stones. Police had to do many rounds of lathicharge against the protesters from both the BJP and Sabarimala Karma Samithi, and it appears from visuals that some protesters have been injured and will be taken to hospital. Sabarimala Karma Samithi protesters had gathered in Neyyatinkara soon after the news of the women entering the temple had broken. They faced lathi charge and water cannons from police who attempted to break up the protest for obstructing public pathways. Protesters in Vadakkara were detained by police after a protest turned violent, with protesters setting fire to boards after they were asked to disperse. BJP and Yuva Morcha protesters in Kozhikode congregated outside the office of the District Police Chief. The protest saw protesters setting fire to a rubber tire and flex boards before being cleared from the area for obstructing public pathways. A protest in Malappuram also saw protesters setting fire to rubber tires. Protesters in Buddha Junction in Mavelikkara, and in Kollam, Adoor, Kothamangalam and Kasargod also obstructed public pathways before their protests were dispersed by police and several protesters were arrested. The BJP and Sabarimala Karma Samithi have promised that protests on this issue will intensify on Wednesday evening and on Thursday. 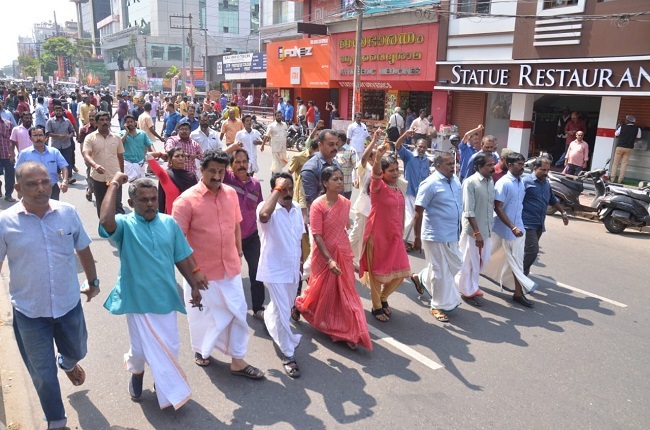 Leader of Opposition Ramesh Chennithala had also called upon believers of all religions and denunciations to take to the streets in protest. A dawn-to-dusk hartal has been called in Kerala on the issue, which the Vyapari Vyavasayi Ekopana Samithi (VVES), a Kerala-wide union of traders and merchants, has said it will not observe after its recent pledge to see 2019 as a year free of hartals in Kerala. However, despite this declaration, shops have been forced to shut by protesters or as a reaction to the protests, in different locations across the state.